is developed, thus giving a more effective way to improve the GUI automation test in Windows OS. machines, i.e. complete interaction sequence (CIS) . management for testing cases and their coverage. improving the GUI automation test in Windows OS. future work are given in Section 4.
outset point in the course of the deep regression test. algorithms are elaborated as follows. elicitation factor during the solution process. which are accessed from the crunode j.
when next crunode is searched. increments. Q and Q’ are both constants. regression test is described as follows. GUI sample event cases can be gained as follows. 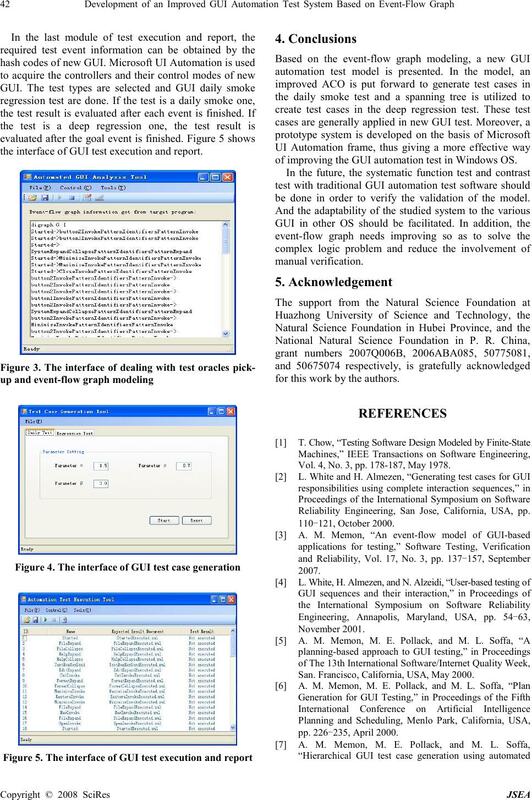 test system is shown below in Figure 1.
standard Win32, Windows Form and Web UI. module to work out an ultimate testing document. 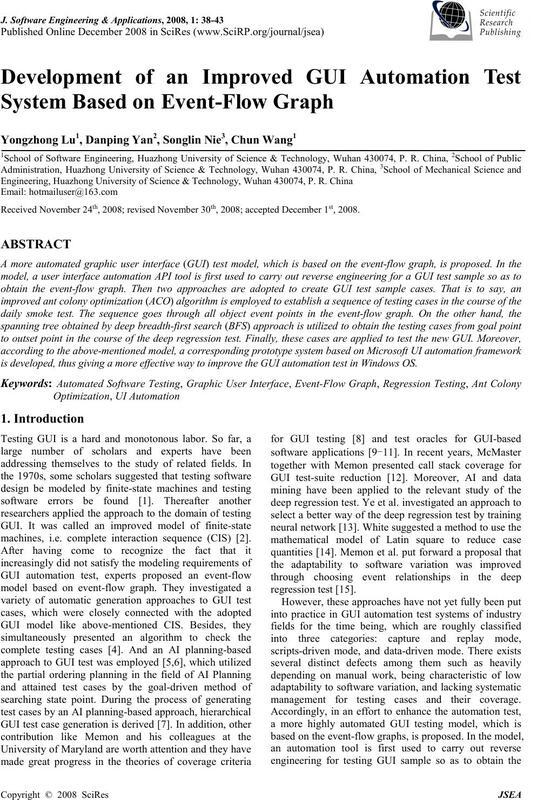 perform a dynamic automatic analysis to GUI sample. 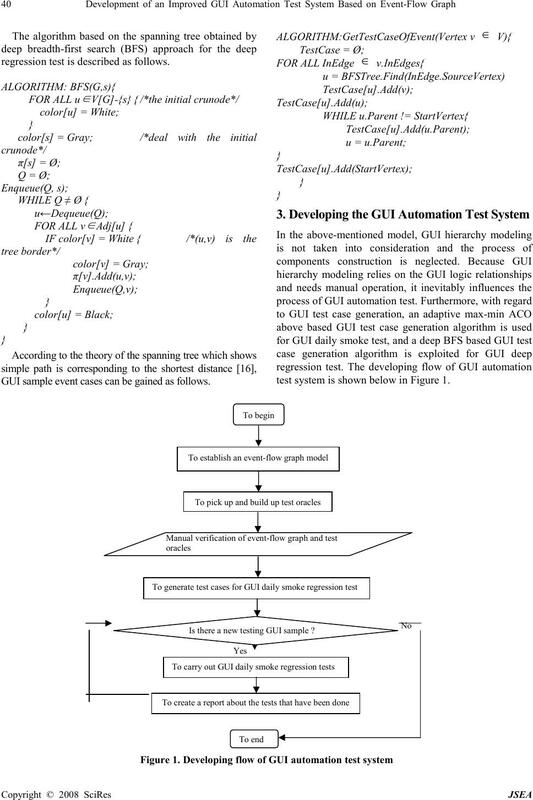 generation algorithms are utilized to generate test cases. shows the interface of GUI test case generation. the interface of GUI test execution and report. of improving the GUI automation test in Windows OS. be done in order to verify the validation of the model. 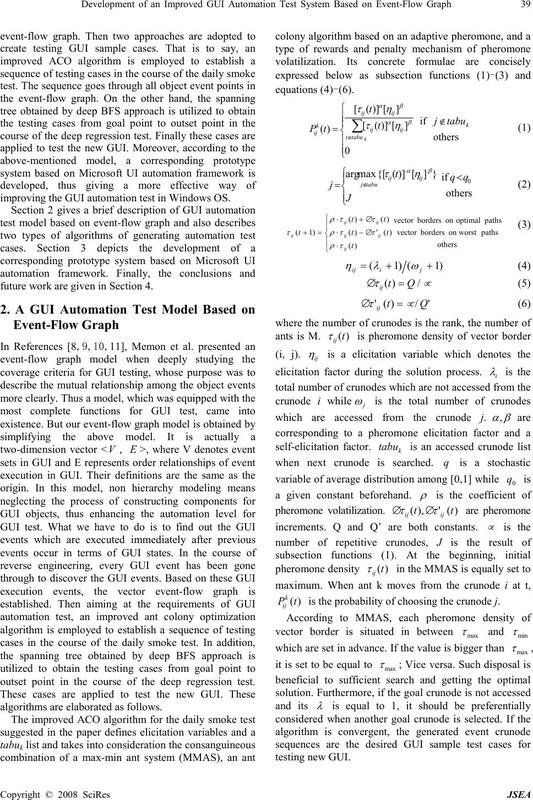 for this work by the authors. Vol. 4, No. 3, pp. 178-187, May 1978. Reliability Engineering, San Jose, California, USA, pp. San. Francisco, California, USA, May 2000. Foundations of software engineering, New York, USA, pp. Methodology, Vol. 16, No. 1, pp. 4-es, February 2007. San Diego, California, USA, pp. 30-39, November 2000. Canada, pp. 164-173, October 2003.